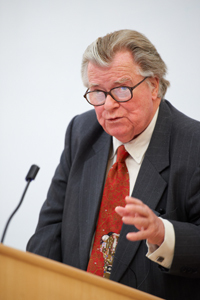 On Friday 4th May 2012 the Centre for Public Law held the eleventh in the series of lectures in honour of Sir David Williams. The lecture, entitled "The Good Constitution" was given by the Rt. Hon. Lord Justice Laws. Thursday 29th November 2012: Professor David Feldman (University of Cambridge) gave a seminar entitled "Anisminic – Then and Now". "Most lawyers agree that Anisminic was a seminal decision, but after 44 years people still disagree about the substance and scope of the legal principles which it exemplifies; as Lord Walker has said, 'its full implications are still open to debate' (R. (WL (Congo) v. Home Secretary  UKSC 12 at ). This is not surprising. In common-law jurisdictions, judicial decisions are strictly speaking evidence of what the law is, rather than a source of law (one of the features that distinguish what we call 'case-law' from legislation). By examining the case in its original commercial, diplomatic, administrative and legal contexts, we might be able to form a better understanding of the reasons why legal arguments developed as they did, and the limits of their implications, particularly in relation to private-law duties and rights." Thursday 15th November 2012: Professor Christopher Forsyth (University of Cambridge) gave a seminar entitled "A Right to Administrative Justice?". "In its second consultation paper, the Commission on a UK Bill of Rights asks whether any such Bill of Rights should contain a right to administrative justice. This raises fundamental questions about the law of judicial review, including: whether the values protected by it can properly be regarded as "rights"; how any such "rights" would relate to the existing grounds of review; and whether a statutory catalogue of such "rights" would clarify or add needless complexity to the law." Thursday 1st November 2012: Dr Jason Varuhas (University of Cambridge) gave a seminar entitled "Liability under the Human Rights Act: Rabone v Pennine Care NHS Foundation Trust". "An analysis of the recent Supreme Court decision in Rabone v Pennine Care NHS Foundation Trust, which raises a number of important issues: in which circumstances will the positive operational obligation to protect life under Article 2 arise? ; who has standing to bring a claim under Article 2? ; how should courts calculate damages awards under the HRA? More generally the case raises interesting issues about the interrelationship between private law and public law liability regimes, and the approach that domestic courts ought to take to determining questions concerning the interpretation of Convention rights which have not yet been addressed by the ECtHR. The presentation will also respond to a number of questionable criticisms of the case that have been advanced by some scholars." Thursday 18th October 2012: Ms Natasa Mavronicola (University of Cambridge) gave a seminar entitled "Wellington and Babar Ahmad: Relativism and Article 3". "This seminar addresses the question of the role of relativism in the application of Article 3 ECHR, which is considered to be an absolute right. This is a matter which has been rendered prominent in the UK after R (Wellington) v Secretary of State for the Home Department, and which was a significant aspect of the judgment of the Fourth Section of the European Court of Human Rights in Babar Ahmad v UK."